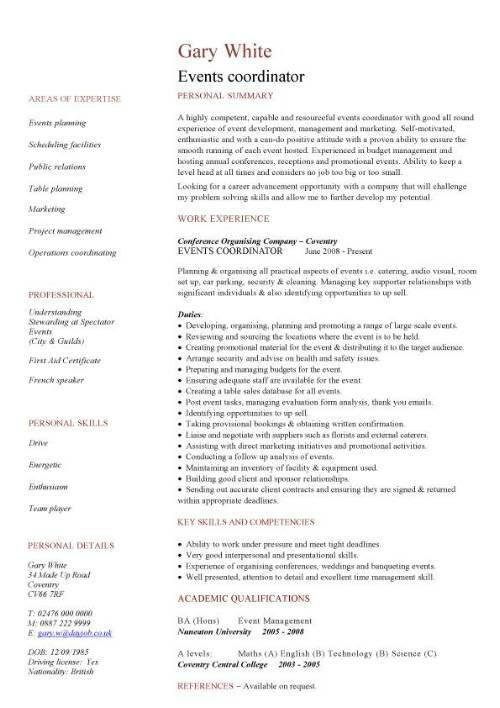 On this page you will find a link to a professionally written events coordinator CV template and also get tips on what points to focus on in your CV. Ensuring adequate staffing levels for events. Extensive knowledge of scheduling and contract administration. Arranging for keynote speakers to attend. Selecting the correct venue for an event. Publishing and distributing promotional material. Liaising with caterers, vendors and suppliers. Negotiating the best price for services. Arranging the conference planning schedule, policies and guidelines. Setting the budget for the venue. Able to work under pressure and to deadlines.